This is one of my favorite pieces, I wear it most of the time with the earrings that match. I have other pieces from Stauer but this is one of my very favorites. It is really beautiful! Received this as a Christmas gift. Gorgeous necklace, the sparkle is brilliant! Can't wait to wear it. I bought this for myself, and just can't stop looking at it. It sparkles and shines, even when the light is low. I just can't get enough of it. Thanks Stauer. Bought this as a Christmas Gift for my Wife. The picture is miss-leading. I thought it would have a light blue hue to it. However it does not. It is actually a clear Diamondaura. I am sure she will still like it. 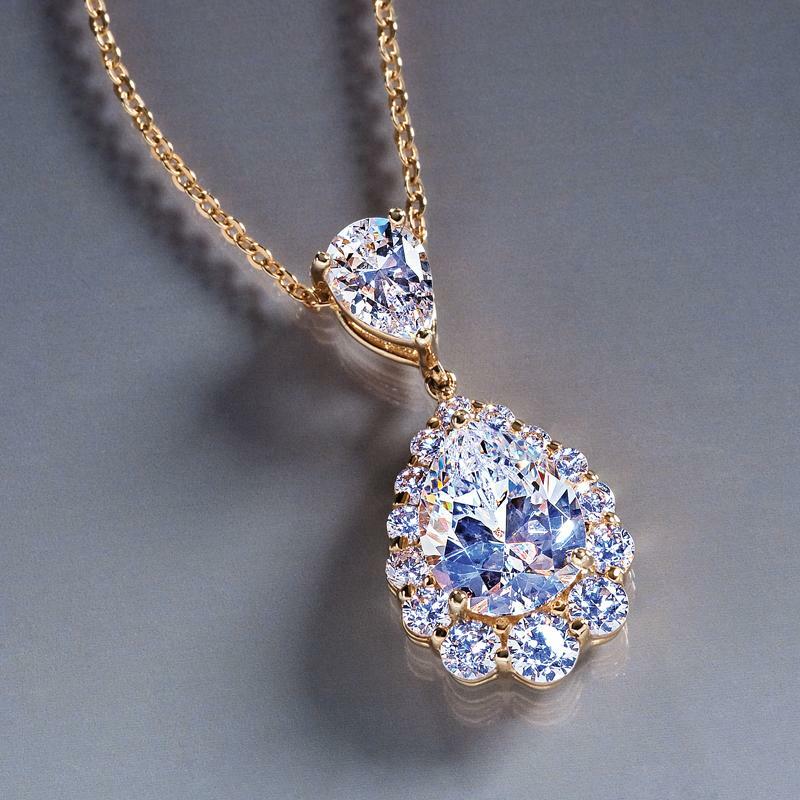 You're invited to the other "Wedding of the Century"
We want you to meet this Royal Pear Pendant in person. That's why, by way of introduction, we've lowered the price of this stunning 3 ¾-carats total weight pendant! Once you get up close to the brilliance of lab-created DiamondAura® — the finest diamond simulant yet — you're going to fall in love. The sparkle is addictive. Stauer proved luxury could be affordable by using science, not snobbery. Our exclusive, lab-created DiamondAura jewelry is a marriage of art and chemistry with all of the classic specifications, including color, clarity, cut and carat weight. But don't take our word for it, according to the book, Jewelry and Gems: The Buying Guide, the technique used in DiamondAura offers, "The best diamond simulation to date and even some jewelers have mistaken these stones for mined diamonds." Perfecting DiamondAura cost over $6 million and the spectacular results can be compared to a "D" flawless diamond. The complex laboratory process involves rare minerals heated to an incredibly high temperature of nearly 5,000° F inside some very modern (and expensive) equipment. But I'm sure you'll agree, it's worth the effort. The centerpiece of the Royal Pear Pendant is a spectacular 2 ¼-carat, lab-created, DiamondAura pear. 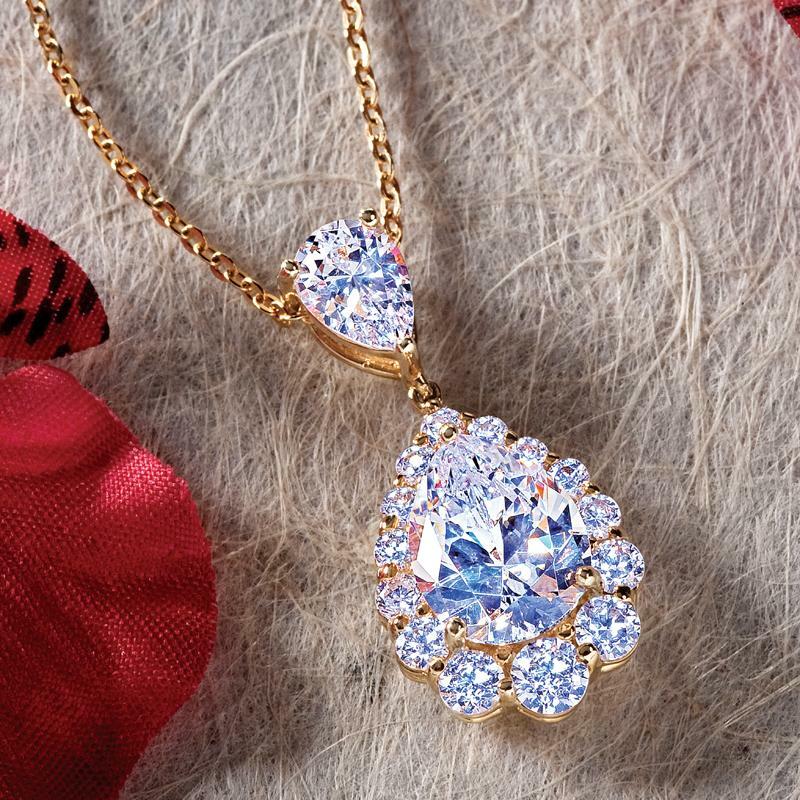 It is surrounded by 14 glittering rounds and dangles from an elegant bail studded with a ¾-carat DiamondAura stunner. Real luxury at a fairy tale price! Chain sold separately.